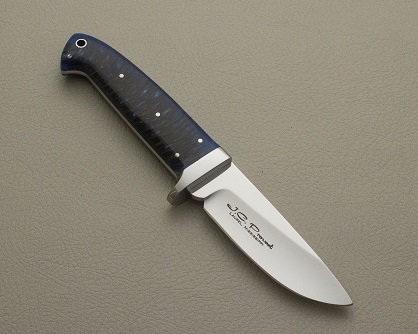 CPM 154 4" drop point, Cryo quench, taper tang, 416ss guard with stabilized blue pine cone handle. Custom sheath. 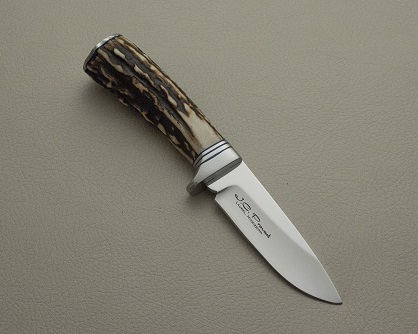 CPM 154 3-1/2" drop point , Cryo quench, hidden tang, 416ss fittings with exhibition stag handle. Custom sheath. 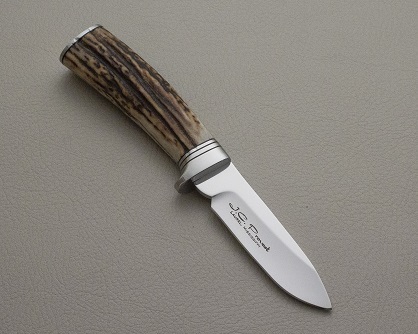 CPM 154 3-1/2" drop point, Cryo quench, hidden tang, 416ss guard with exhibition Stag handle. Black G10 & turquiose spacers. Custom sheath. 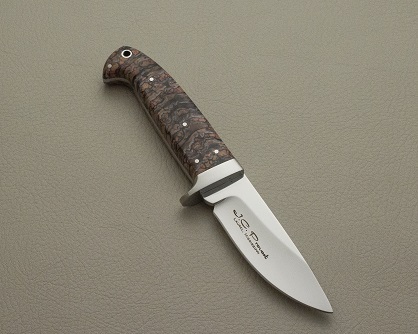 SCRMC 2018 Art of Healing auction knife! 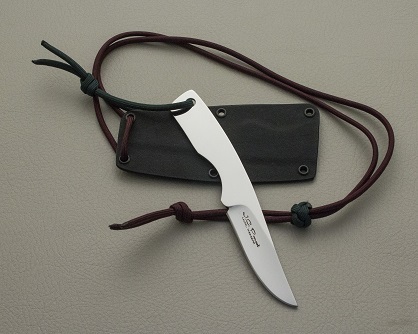 CPM 154 neck knife, Cryo quench, taper tang, fittings 416 ss with stablized mammoth tooth handle. Custom sheath. 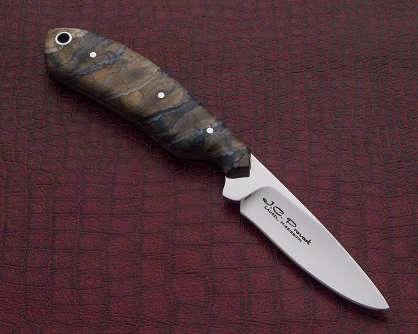 CPM 154 4" drop point, Cryo quench, 416 ss fittings, hidden tang with exhibition stag handle. Custom sheath. 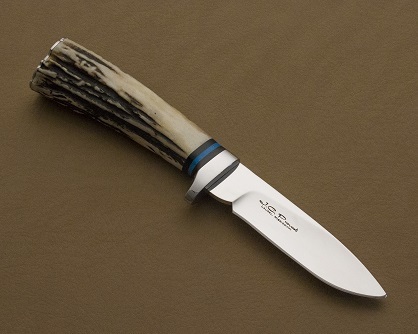 CPM 154 3-1/2" drop point, Cryo quench, 416ss guard, taper tang with stabilized mammoth black/coral tooth handle with 416 guard. Custom sheath. 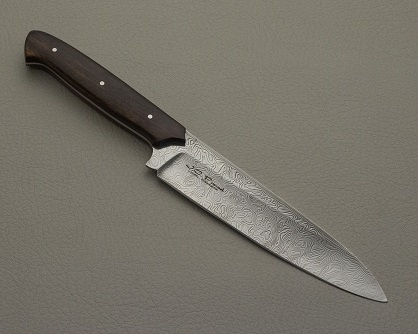 Damasteel "Little Elliot" chef knife, Cryo quench, 416 ss fittings, taper tang with desert ironwood handle. Custom sheath. 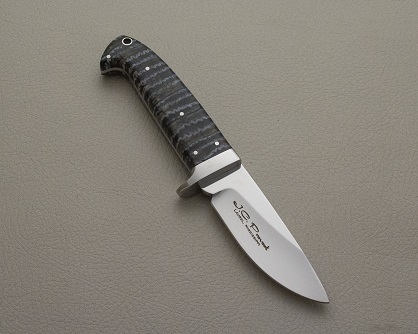 CPM 154CM 3-1/2" Drop point, Cryo quench, taper tang, 416ss guard with stabilized mammoth black tooth handle with inlay. Custom sheath. 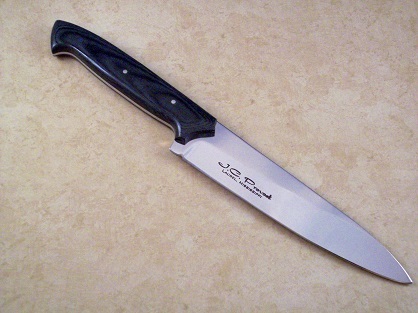 CPM 154CM "Little Elliot" chef with black micarta handle.